Compiled from the official "Final Report of Changes" dated September 11, 1944, other Navy documents, and a list created by the York family. * Those that lost their lives on August 15, 1944 during the invasion of Southern France, when the 282 was destroyed, are marked with an asterisk. Ratings are last known. Cities are either hometown or place of enlistment. NFR = Not in Final Report. These are listed in some documents but not on the "Final Report of Changes"
Click here for information on the Army personnel who were aboard when the ship was hit. Please advise us of any changes, corrections or additions. If you have an e-mail address for one of the crew please also provide that. Moberly, Joe H. , CCS U. S. N. , Mayport FL? If anyone has more information, or corrections please contact us. We would especially be interested in information about the Army personnel who were being transported. My grandfather served on the LST 282 and was aboard when the ship sank. 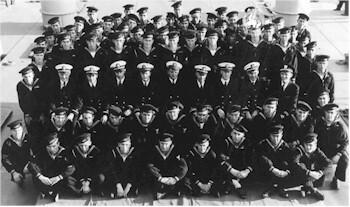 Although his name is not listed I am 100% certain that in the photo of the crew that he is the gentleman on the far left out a little way between the first and second row. His name is J.D. Kiker. He enlisted in Chatanooga, Tennessee. I was aboard 282 when it got bombed, evacuated to 283 down the beach. I was electrician on 282 in aux. engine room when bombed. I'm 84 years of age living in Texas for last 50 years. Thank you for correspondence and adding my address to site. What is your idenity to this site. My name is Michael Louis Guarino. I was on the LST 282 when it was sunk by a German buzz bomb August 15, 1944. I was manning the 40 mm on the fan tail when we where struck. I was picked up by a LCVP, taken to another ship and transported to Naples. I was hospitalized in Naples and released about Sept. 1944. I was returned to the United States aboard a hospital ship to Charleston, South Carolina Naval Hospital. I received a medical discharge November 4, 1944. I noticed that my name was not on the crew list. Was the crew list covering a certain period? I was assigned LST 282 around July, after being on a survivors camp for thirty days, after my first LST 376 was torpedoed on June 9, 1944. I have e-mailed you on behalf of my father, for he has no computer or e-mail address. I know that Michael Guarino was on the 282 when was she was sunk. The Yorks didn't get his name on their list. I know she didn"t get them all and that after Normandy we had taken on replacements from an LST that was torpedoed in the English channel. I have a list of crew that was transferred to other stations after our ship was hit. His name was on the list showing that he was sent to a hospital in Naples, Italy. Is their some way you can add him to the survivors list? His rating was (S2C) Seaman Second Class. 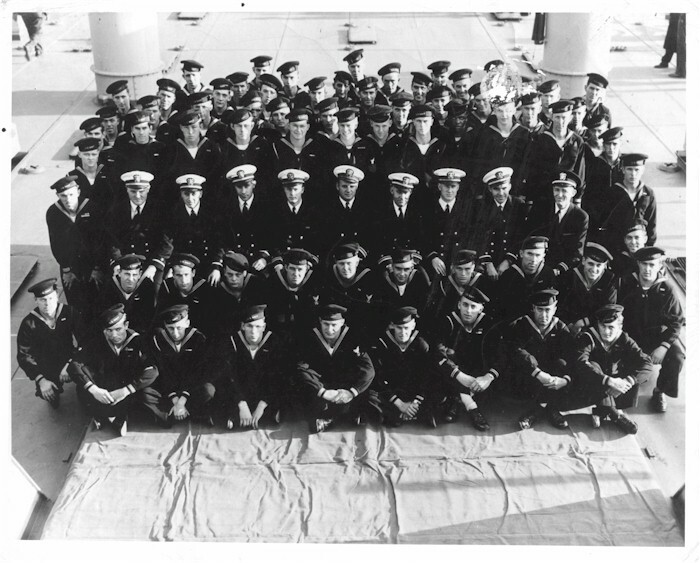 When those men came on board after being survivors of a torpedoing, we couldn't believe that they weren't sent home Surviving two sinkings in two months is going through hell twice in two months. I can't remember him because he was with us a short time. I often think about how many of those replacements survived the bombing. From Sheldon Aubut: I've added Michael Guarino to the list If there are others please let me know, and if anyone else has any information that they would like added to this site please e-mail me. Hi Tom I just happened to find your web site and noticed that a crew member whose name was Russell Page was not listed, Page was a cook on 282 when it was bombed, He survived, I met page at US navy base 2 in Scotland where he was sent along with 5 or 6 other survivors for transportation back to the US. Page and I were were from the same town in Warren, R I so we had a short reunion in Scotland. Page passed away about 18 months ago at the age of 77, I later became a crewmember on LST 162. You may want to up your web page. We did meet again after the war.